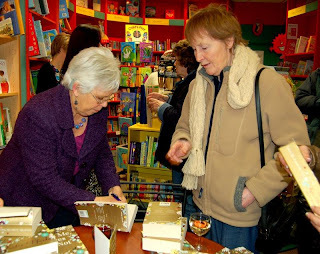 As contributors to the RNA’s golden anniversary anthology of short stories, Loves Me, Loves Me Not, we were delighted to be invited to the Torbay Bookshop in Paignton to meet readers and other writers, and to sign copies of LMLMN. Although Monday February 8th was as cold and wet as most English winter evenings, dozens of people turned up to see us and buy books. Torbay bookshop owners Sarah and Matthew made us very welcome indeed, and provided wine and fruit juice for everyone, even Linda’s little grandson, who was as good as gold, and is obviously going to grow up to become a great reader! The Torbay bookshop is one of the most successful and most highly-regarded independent booksellers in the whole of the UK, and we were delighted to be able to take part in an event in such a warm and welcoming atmosphere. Hurrah! The paperback of Loves Me, Loves Me Not is going to be on the shelves and not a moment too soon. February is just the perfect month for curling up on the sofa, preferably under a fluffy blanky, with a mug of hot chocolate and a great book. And, believe me, this collection of short stories is a cracker. Once you start, you won’t want to put it down. You’ll be begging for five inches of snow again just so you can stay tucked up in the house to read. Just joking! I’ve already dipped into the stories and particularly enjoyed the one by Joanna Trollope - who never disappoints - and Elizabeth Chadwick whose tale is a masterclass in short story telling. The art of the short story is much under-rated and I love the way you just get a little snippet of someone’s life and are always left wanting more. It’s also lovely to see all these terrific romance writers snuggled between the covers together. Aren’t we lucky to have such fabulous proliferation of romance writers in this country? Romance is dead? Pshish. Don’t you believe it. As far as I’m concerned it’s alive and well and thousands of discerning readers agree. When everything else is doom and gloom, isn’t it lovely to escape into the arms of a wonderful, romantic hero? Works for me everytime! Even if you’ve started the year on a money diet (the thought of giving up chocolate and wine has long gone) paperbacks are still such incredible value. For the price of a bottle of plonk you can have hours of entertainment – and you’ll also be able to remember what you did the next day. So go out and buy Loves Me, Loves Me Not – you know you want to! 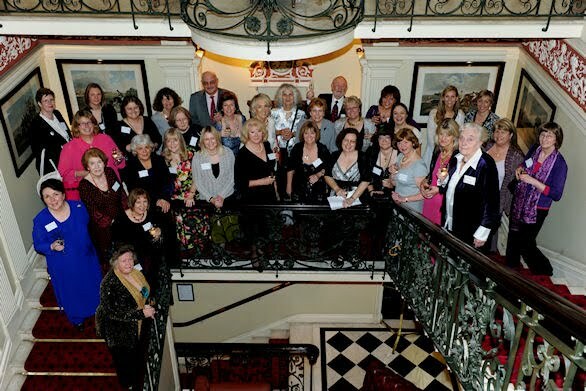 Judy Astley writes about the party that launched the RNA's 50th anniversary celebrations. Well don’t we RNA folks scrub up well? The cocktail party launch for Loves Me, Loves Me Not had all of us in full glitz and gorgeousness… and that was just the boys. The venue was the Cavalry and Guards Club on Piccadilly - an appropriately glam location hung all about with portraits of horse-mounted battles, medal-decked generals and Men in Uniform. Drink flowed. Phil Weedon very wisely photographed all the contributors on the staircase from above for max glamour/ slenderness impact and speeches were generous, warm and… short. 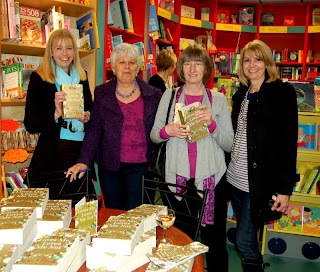 Katie Fforde referred to our Big Fat Gold Book and toasted: 'To Us.' Claire Somerville of HMB called the book 'A pot-pourri of story-telling' and Sue Moorcroft kindly (and surely inaccurately) said that the authors had been ‘absolutely no trouble’ during the book’s compiling. She then thanked - and made a presentation to - Jan Jones, who had so tirelessly read every single contribution to the book. A fab ‘do’ all round – friendly, fun as well as thoroughly and deservedly celebratory. As I left, I went upstairs to collect my coat and came across a large gathering of dinner-jacketed men. Obviously I couldn’t help imagining them in uniform, scarlet jackets, swords, plumed headgear, gleaming boots… on horseback. Mmmmm…. I was so excited to receive a copy of LOVES ME, LOVES ME NOT a few weeks ago. The cover is just gorgeous and I couldn’t believe how big it was, but then it does contain forty stories which, at my reckoning, is around 200,000 words. A real blockbuster of a book. I’m still working my way through the stories, picking and choosing to meet my mood. But that’s the joy of an anthology of short stories. You can read a story in the bath, or before bed, or maybe lose yourself temporarily in another world for ten minutes while the potatoes boil dry on the stove. The range in this anthology is just amazing. I’ve read my first ever vampire story, a charming Regency, stories set in Australia, in the middle ages and very much in the here and now. I have found some wonderful new authors and been entertained by a lot of old favourites. I’ve laughed, cried and been totally blown away by a story so shimmeringly beautiful that it is worth the price of the book all by itself. My story, THE PARTNERSHIP DEAL offers, I hope, the essence of what I write for Mills & Boon “Romance”. A little humour, a little sizzle and, after a very unpromising beginning, followed by an even worse discovery, the promise of an unexpected future. Definitely one for the Christmas stocking of anyone you know who loves to read. 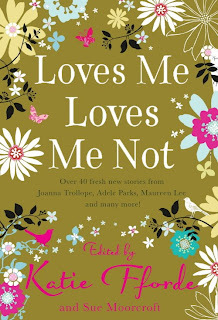 ‘Loves Me, Loves Me Not’ is an anthology that you just have to buy! It’s huge, with a stellar cast of authors, incredible value for money. The stories cover a wide range of topics, ranging from amusing to deeply romantic, poignant to just about everything! Even if you don’t normally read romantic fiction (that does happen, strangely) you might like to try this book. I’m thrilled to be writing the opening entry for this blog, because I’ll be back in Australia when the Romantic Novelists’ Association November party takes place to launch the anthology. (Sobs quietly into handkerchief). Life is hard. They have great parties. In fact, they’re a great organisation. I’d written a novel set in Western Australia in the 1920s, so set my anthology story ‘Gracie’ there too, as it’s such a fascinating era/place. Gracie emigrates to avoid returning to a maid’s job after her war work, and can only get a job as a maid at first. But she’s determined to branch out. The novel is ‘Freedom’s Land’, a story about the Group Settlement Scheme, an almost forgotten part of history. The West Australian government gave away forest land to ex-servicemen, many from the UK, on condition they cleared it and set up dairy farms. The trouble was, you had to be married, so widowed Andrew and Norah made a marriage of convenience and set off with their children to build a new life. Could they make a go of this hard life? And of their hasty marriage? Read ‘Freedom’s Land’ and find out. I write historical sagas for one publisher and modern novels for another. The variety keeps me happy and readers don’t seem to object. I’m either a storyteller or a madwoman (the former I hope!) because I have characters wandering around inside my head all the time nagging me to tell their tales. I try to keep up with these ‘people’, but three novels a year is all I can manage. ‘Saving Willowbrook’, my next modern novel, comes out in November 2009 in paperback. 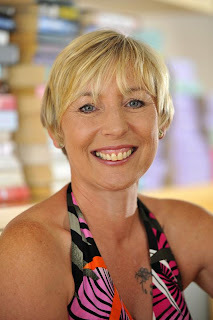 You can find details of all my books on my website http://www.annajacobs.com and read the first chapters. I should warn you in advance that my stories all have happy endings, so if you like feeling miserable, don’t buy them. I prefer to leave my readers and myself feeling happy! NB If you’re not in the UK you can buy the anthology post free to anywhere in the world from www.bookdepository.co.uk You can buy my books there, too! And now, I’d better get back to the current set of characters who are still struggling to sort out their lives and populating my dreams. Jean Buchanan, a Scot brought up in Wales, read English at Oxford then went into publishing. Marriage, motherhood and writing took over in the 1980s, though she still freelances for Oxford Dictionaries of Quotations -- her favourite project so far is Love Quotations (1999). Her husband is a theoretical physicist, their son is grown up and she is currently writing a romcom. Her writing career started with short stories for Woman’s Weekly and Bella, then a tv script for Jackanory Playhouse (BBC-1). She moved into sitcom with her tv series The Wild House (short-listed for a British Comedy Award) and Welcome to orty-fou, and she has also written for puppets. Her employment CV includes a brush with the civil service, selling gents’ ties in the poshest department store in Wales and organising international conferences. She can make fingermice and gets truculent about the quality of ice-cream. Her interests include early music, France, Scottish country dancing and ornithology. Her hobbies are croquet, Scrabble, and planning holidays in the South of France but ending up in Barnstaple. Joanna Maitland is a Scot living in England, just a few miles from the Welsh border. She loves having access to the history of three countries as background for the Regency historical romances she writes for Harlequin Mills & Boon®. There are eleven so far, taking the reader to Regency England and Scotland, and to glittering European cities like Paris and St Petersburg. Rita Bradshaw was born in Northamptonshire, where she still lives today. At the age of sixteen she met her husband and they have two daughters, a son and three grandchildren, plus the most recent addition to the family – a gorgeous little puppy who’s the latest in a long line of beloved dogs. Twenty years ago, Rita’s first attempt at a novel was accepted for publication by Mills & Boon under her pseudonym, Helen Brooks, and her 57th novel, The Boss’s inexperienced Secretary, was published in July 09, with a seasonal-themed story arriving on the shelves in November, in time for Christmas. Rita also writes gritty north-east sagas for Headline Publishing under her own name. Her 13th paperback, Gilding the Lily, was published in the summer and Born to Trouble will be available in January 2010. Rosie Harris was born in Cardiff and for several years worked in the City Hall. Her husband, Ken, was from Wallasey and after they married they lived on Merseyside for many years. She has been writing since the 1950’s. In the 1960’s she ran her own agency, Regional Feature Service, writing articles for most of the provincial newspapers. During the 70’s she became Editorial Controller for a non-fiction house. In the 1980’s, after publishing a number of non-fiction titles she turned to fiction and during the 1980/90’s had a number of short stories published as well as five books by Sphere under the name Marion Harris. Since 2002 she has had some 20 books published by Heinemann/Arrow. She sets her books in the 20’s because she has a great admiration for the women who were wives and mothers in those days. They had none of the current time-saving equipment – no washing machines or vacuum cleaners, no instant electric fires or cookers, and certainly no Internet. Their days were long and arduous and often they had to manage on very little money. In 2005 she was one of the judges when Arrow and Asda collaborated in a major national competition to find the next big saga writer. Trisha Ashley was born in St Helens, Lancashire, and now lives in the beautiful surroundings of North Wales. She is the author of three historical novels and nine contemporary ones, the latest of which is Wedding Tiers, published by Avon, Harper Collins, though she is happy to say that her own wedding day was a bit less wacky than some of the ceremonies in this book… She has a website at http://www.trishaashley.com/ where she would love you to sign up for her newsletter, Skint Old Northern Woman, so you can get all the news from Trishaworld on a regular basis. Carole Matthews is an international bestselling author of hugely successful romantic comedy novels. Published in twenty-four countries, her unique sense of humour has won her legions of fans and critical acclaim all over the world. In the UK, her books include Let’s Meet on Platform 8, A Whiff of Scandal, More To Life Than This, For Better, For Worse, The Sweetest Taboo, With or Without You. Latest bestsellers include the hilariously funny novels The Chocolate Lovers’ Club, The Chocolate Lovers’ Diet, It’s A Kind of Magic and All You Need is Love. A Minor Indiscretion and A Compromising Position both reached the Top 5 in the Sunday Times bestseller chart in the UK. You Drive Me Crazy reached number 8 in the original fiction charts. Welcome To The Real World was short-listed for Romantic Novel of the Year. The Difference A Day Makes and That Loving Feeling are out now. In the USA, For Better, For Worse was selected by one of America’s top TV books clubs – Reading with Ripa on LIVE with Regis and Kelly – as their book of the month. As a result it went straight into the USA Today and New York Times lists. The rights for A Minor Indiscretion and For Better, For Worse have been sold to Hollywood. Carole recently co-edited two new editions of the hugely popular charity series called Girls' Night Out - one for the USA and one for Canada. All proceeds will go to War Child. Carole has presented on television and is a regular radio guest. When she’s not writing novels, television or film scripts she manages to find time to trek in the Himalayas, rollerblade in Central Park, take tea in China and snooze in her garden shed in Milton Keynes. or if you want to chat to Carole you’ll find her on Facebook and Myspace. Louise Allen has written thirty historical romances for Harlequin Mills & Boon, all but one set in the Regency period. She began while working as a property manager but has now been writing full time for two years. Her latest book, The Piratical Miss Ravenhurst (September 2009), completes her six-part series, Those Scandalous Ravenhursts, and in 2010 she is contributing two stories to an eight-part Regency continuity published by Harlequin Mills & Boon. She has a large collection of Regency fashion prints and loves researching, whether it is on the battlefield at Waterloo or walking through London guided by an 1814 map. Sue Gedge taught Drama in London schools for twenty years before taking retirement in order to concentrate on writing. Her short stories have been published in All Hallows, Supernatural Tales and The Silent Companion, and her play, A Present from Cookham, about the painter Stanley Spencer, was performed at the Lilian Baylis Theatre, Sadler’s Wells. Sue studied Creative Writing at Birkbeck College, London and has appeared twice at the live reading event, Writloud, at RADA. Her first novel, a romance with a dark supernatural twist, The Practical Woman’s Guide to Living With the Undead, can be read on the Harper Collins website http://www.authonomy.com/. Charlotte Betts discovered a passion for writing after her five children had grown up and left her in peace. Demanding careers in hotel design and property force her to be inventive in finding time to write but she has achieved seven novels in eight years. One of her short stories was published in Scribble and others short-listed by Writers’ News and Real Writers’. She has won first prize in five short story competitions and wrote a regular column on interior design for The Maidenhead Advertiser for two years. She is a member of WordWatchers http://www.wordwatchers.net/ and the Romantic Novelists’ Association. Katie Fforde is the chairman of the Romantic Novelists’ Association in this, its 50th Anniversary year. Sophie King has written five novels, all of which are published by Hodder & Stoughton. They include the best-selling The School Run, The Supper Club and her latest novel The Wedding party. All her novels are aimed at women (and some men) from teens to grannies. She specialises in dysfunctional families – both in practice and on paper - but her page-turning novels will make you laugh as well as cry. Sophie also teaches creative writing at Oxford University and is the author of How to Write Short Stories for Magazines and Get Published (How To Books). Her real name is Jane Bidder. http://www.sophieking.info/. Australian by birth, Janet Gover has travelled around the world as a journalist and broadcast consultant. Her work has appeared on major national and international television networks in Australia, Asia and the UK. Her first fiction was published in 2002. Since then, her short stories have regularly appeared in women's magazines in the UK and Australia. "Waiting for A Wish" won the RNA's Elizabeth Goudge Trophy in 2007. Janet is a graduate of the RNA's New Writers' Scheme. Her first novel, The Farmer Needs A Wife, was published in January 2009 by Little Black Dress, her second in December 2009. Read more about Janet and her work at http://www.janetgover.com/ . It's an ill wind that blows nobody any good and for Linda Mitchelmore it was losing her hearing to a viral infection that prompted her to write. She signed up to a postal short story writing course with Writing Magazine and has now had some 150 short stories and serials published in national magazines in the UK, Sweden, South Africa and Australia. For Linda, it has come full circle since she signed up for that short story writing course as she is now a preliminary judge for Writing Magazine competitions. Linda has been a member of the RNA's New Writers' Scheme for far too long, but alas she has not made it as a novelist - yet! Christina Jones has been writing all her life. Since having her first story published at 14 she has had more than 2,000 short stories published in magazines around the world. She also writes romantic comedy novels and has recently won the Pure Passion Award for Love Potions and the Melissa Nathan Comedy Romance Award for Heaven Sent. She lives in rural Oxfordshire with her husband, daughter and a houseful of much-loved rescued cats, works as a part-time barmaid – for the company (writing’s a lonely business!) and the people-watching inspiration – and never has her head out of a book – preferably a crime novel. Her favourite authors are Peter Robinson and MC Beaton (alive) and Dickens and Agatha Christie (dead). Christina loves animals, fairgrounds, football, steam trains, flying, talking and listening, music, the sea, eating and Coronation Street. Christina’s lifelong ambition is to own a model railway. A first prophetic feature on the coming IT revolution was published by Geoffrey Harfield in the early 1960s. During a career in photography and advertising in the 70s he wrote PR and sales copy and began writing historical fiction 18 years ago. His preferred period is 1860 to 1945. Geoffrey has reviewed plays and shows for local theatre and completed four or five historical saga romances with characters in the conflict of the Russian revolution, WW2 and the IRA troubles. Ten years ago he wrote an Irish novel with a peace prize-winning heroine, who moved to the USA, and a lusty black president. He now writes fiction each day and reviews books for the Historical Novel Society. evil. However, thinking deeply on philosophy, war and religion, he believes in the essential goodness of humanity. Theresa Howes started life as an actress, working in all aspects of theatre from washing showgirls’ tights and selling ice creams to playing a variety of roles, including overgrown schoolgirls and nineteenth century tragic heroines. Those periods euphemistically known as ‘resting’ gave her the time to start on that first opening chapter and since then, she has never looked back. Although yet to have a novel published, she has been joint runner up of The Harry Bowling Prize, short listed in a Write a Bestseller competition run by Channel 5 and Poolbeg, and was long listed for Lit Idol. She has won many short story competitions and had a number of stories published in a popular weekly magazine. Her ambition is to write novels and short stories that women will want to read, and to write them well. When Sophie Weston was born, her father took one look and said, 'Good grief, she's cross-eyed and ginger.' He got away with it because he'd braved ice and snow to get there. Katie Flynn was born in Norwich and attended Norwich High School, where she was extremely happy and extremely undistinguished. Published at the tender age of eight, in Enid Blyton's Sunny Stories, she joined a Writers’ Circle as an adult, publishing short stories, articles, etc; only turning to novels in 1971 because the postal strike cut off her main source of income! Margaret James has been a member of the RNA for 22 years. She has written thirteen published novels, many short stories, and she also teaches creative writing for the London School of Journalism. Margaret's first novel was A Touch of Earth, a family saga set in Herefordshire where she was born and grew up, and her most recent is The Penny Bangle, set in Dorset and published by Robert Hale. But her personal favourite among her novels is Elegy for a Queen, published by Solidus, a small independent which has a varied and fascinating list. Margaret now lives in Devon, which she loves, and has a website at http://www.margaretjames.com/. Eileen Ramsay shares a birthday with Jane Austen and with Beethoven but had heard of neither when she wrote her first stories. She was seven. Educated in Scotland and the United States, she taught in both countries - often about Austen or Beethoven. Her writing for children and adults has won several awards, including the Constable and Pitlochry trophies from the Scottish Association of Writers and the RNA's Elizabeth Goudge Award. In 2004 she was short listed for the Romantic Novel of the Year award. She is currently writing her - she thinks - twentieth novel. Diane Pearson has been both editor and author for most of her working life. Her first novel was published in 1967 while she was working as a full-time book editor at Transworld Publishers – a post she held for 38 years. Two of her major novels, Csardas and The Summer of the Barshinskeys, became bestsellers both in the UK and in America. She has had many short stories published, both science fiction and romantic, and her latest novel was Voices of Summer, set in the world of opera and operetta, of which she is an ardent fan. In the 1993 British Book Awards she was voted Editor of the Year. Diane has been the president of the RNA for many years and has given time and commitment above and beyond the call of duty. The Association thanks her. Loads of brilliant stories from your favourite authors! And here are some of our latest novels!